Three (3) gold coins. 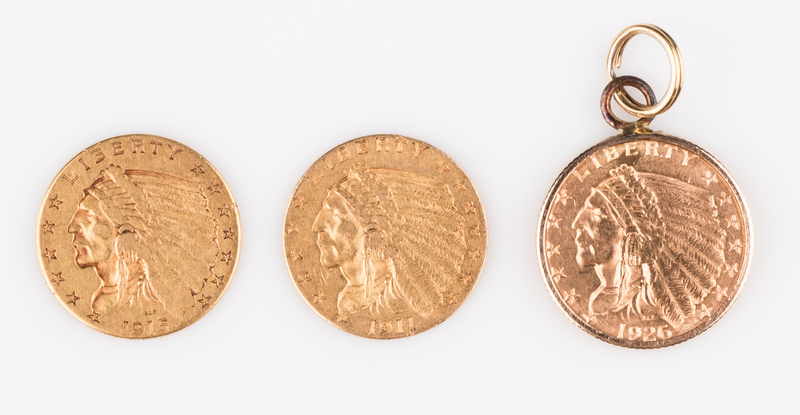 1st item: 1926 2-1/2 dollar Indian Head gold coin, 900 fineness, set in 14K yellow gold frame mounting, 5.1 grams. 2nd-3rd items: 1911 and 1915 2-1/2 dollar Indian Head gold coins, 900 fineness, 8.3 grams together. 13.4 grams total weight. Provenance: Estate of Barbara Gipe, Kingsport, TN. CONDITION: All in circulated wear. Ungraded.